Dr. Thorpe is an expert on issues of health care financing, insurance and health care reform. 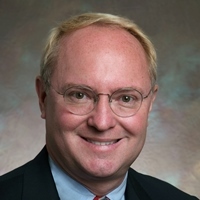 Kenneth Thorpe, PhD, MA, is the Robert W. Woodruff Professor and Chair of the Department of Health Policy and Management in the Rollins School of Public Health of Emory University. He also serves as the executive director of Emory's Institute of Advanced Policy Solutions (IAPS) and director of the Institute’s Center for Entitlement Reform. Additionally, Dr. Thorpe is chairman of Partnership to Fight Chronic Disease, an international coalition of over 80 groups focused on highlighting the key role that chronic disease plays in the growth in healthcare spending and the high rates of morbidity and mortality, and he serves as co-chair of the Partnership for the Future of Medicare. Prior to joining Emory, Dr. Thorpe was the Vanselow Professor of Health Policy and Director of the Institute for Health Services Research at Tulane University. He was previously a Professor of Health Policy and Administration at the University of North Carolina at Chapel Hill, an Associate Professor and Director of the Program on Health Care Financing and Insurance at the Harvard University School of Public Health and Assistant Professor of Public Policy and Public Health at Columbia University. Dr. Thorpe has also held Visiting Faculty positions at Pepperdine University and Duke University. Dr. Thorpe was Deputy Assistant Secretary for Health Policy in the U.S. Department of Health and Human Services from 1993 to 1995. In this capacity, he coordinated all financial estimates and program impacts of President Clinton’s health care reform proposals for the White House. He also directed the administration's estimation efforts in dealing with Congressional health care reform proposals during the 103rd and 104th sessions of Congress. As a respected health care expert, Dr. Thorpe regularly testifies before committees in the U.S. Congress and in front of governments around the world on aspects of health care reform, and he is a frequent national presenter on issues of health care financing, insurance and health care reform at health care conferences, television and the media. Dr. Thorpe received his PhD from the Pardee Rand Graduate School. Prior to earning his PhD, Dr. Thorpe earned his MA from Duke University. Dr. Thorpe has authored and co-authored over 120 articles, book chapters and books. In 1991, Dr. Thorpe was awarded the Young Investigator Award presented to the most promising health services researcher in the country under age 40 by the Association for Health Services Research. He also received the Hettleman Award for academic and scholarly research at the University of North Carolina and was provided an "Up and Comers" award by Modern Healthcare. Dr. Thorpe was awarded the annual Excellence in Patient Care prize from the National Association of Chain Drug Stores in 2014. He also received the 2012 Champions for Healthy Living Award presented by the YMCA of the USA.